It’s not every day that you see scaffolding suspended from a temporary roof surrounding a building more than 100 years old. But, this is just what has been created at the North Yorkshire County Council (NYCC) Hall in Northallerton by contractors Tiger Scaffolding. Faye Callaghan visited the site for AccessPoint to take a closer look. The NYCC building has been home to North Yorkshire County Council since 1974 but the building itself is more than 100 years old. The building is a stunning example of turn-of-the-century architecture and celebrates Grade II listed status. The building has been undergoing renovations and repairs since August 2016 provided by William Birch & Sons Ltd and work is due to continue until August this year. As part of the extensive restoration project, Whitby-based Tiger Scaffolding was enlisted to provide scaffolding services to allow for the roof and external building to be repaired and rejuvenated. Due to the delicate nature of the building and its listed status, the brief for the contract was both detailed and complex. It specified that no weight could be placed on the roof and that no scaffold could be tied into the building. Additionally, the scaffolding also had to be constructed while still allowing for vehicle access to the site at all times. Tiger’s solution to this complex brief is impressive. At its heart, a unique free-standing structure has been created. It wraps around the entire building without coming into contact with it at any point, and still allows for site access. This free-standing structure then provides the base on which a temporary roof has been constructed, meaning the building’s existing roof is completely protected. The temporary roof then provides the basis for what is perhaps the most fascinating aspect of this complex build. Here, Tiger has created a 17m² scaffold which is completely suspended from the temporary roof. 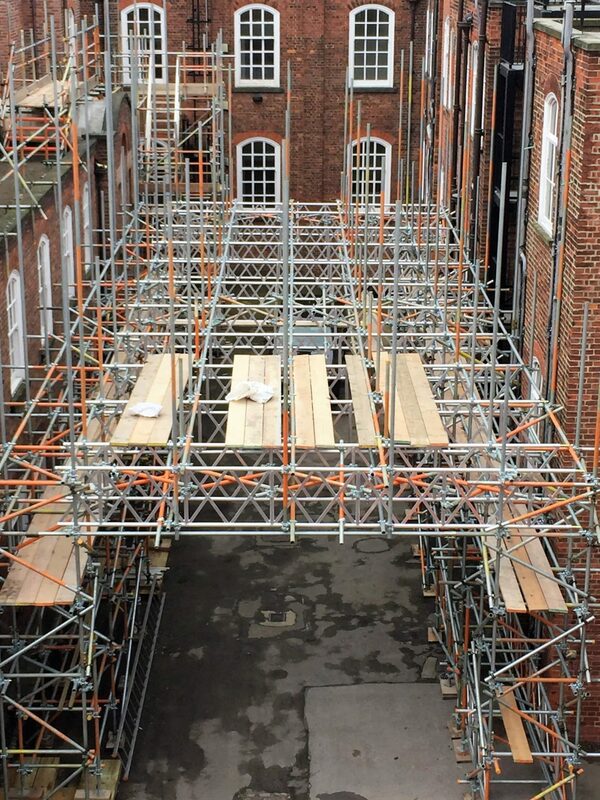 This scaffold provides tiered access platforms around the building’s roof to enable contractors to undertake their specialist repair and restoration work safely. A free-standing structure on this scale is rare, particularly one that supports both a temporary roof and suspended working platforms. As testament to the complexity of the job, the list of components used during the build is also fairly impressive. The completed structure contains nearly 145,000 feet of scaffold tube, more than 30,000 scaffold fittings – with around half of those being recently developed KLAWZ fitting – nearly 50,000 feet of wooden scaffold planks and almost 500 metres of structural X beams. My visit to the NYCC Hall was both fascinating and inspiring. It’s reassuring to see contractors working hard to be innovative, forward thinking and proactive, striving not only to deliver customer satisfaction and quality workmanship but also to ensure the health and safety of everybody involved in the project. This project was exacting and complex in its nature and provided a showcase for just what the scaffolding industry can produce when put to the test. By adopting the use of the innovative KLAWZ fitting, Tiger was able to reduce the amount of tube by more than 25 per cent at Northallerton and erect the scaffolding 25 per cent faster than with traditional methods. This led to reduced labour costs thanks to a shorter installation time with less labour required to erect the structure within the agreed programme. Using fewer materials also reduced lorry movements to get tube and fittings to and from the site leading to lower transport costs and reduced environmental impact.